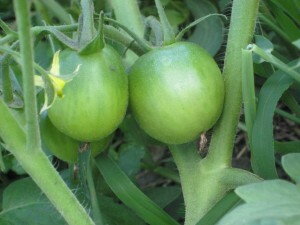 Home » edible » Is A Tomato A Fruit Or A Vegetable? A question even more hotly debated than the one about the chicken and the egg. What, in fact, is a tomato? A sweet fruit or a savory vegetable? The answer to this question is easy. It just happens to change every time someone asks it. Like many questions, the key point is the agenda of the questioner. Compared to peaches, apples, and cherries, which are routinely made into sweets and desserts—pies, ice cream, jam, what-have-you—tomatoes clearly are not in the same category. Okay, there are outliers, people who make tomato jelly or put milk and sugar on a dish of cut-up tomatoes. But tomato-flavored chewing gum? Cough syrup? Jelly beans? Never. Surely, tomatoes are designed to be the mainstays of pizza, lasagna, meat loaf, and other places where fruit has no business. So if you’re a cook, you’d definitely call tomatoes a vegetable. Unless you’re making tomato jelly. But if you’re a botanist, the word “vegetable” is not in your vocabulary. Vegetable is a culinary term. Botanically, tomatoes are classified as fruits, since they are the ripened ovary of the tomato flower. Fruits are the part of the plant that contains the seeds, the tasty key to the plant’s future. Apples are fruits. Hot chili peppers are fruits. Zucchinis and eggplants are fruits. Coffee is a fruit (the bean, that is.) Black walnuts are fruits. I admit it seems bizarre to use the same word to describe strawberries and acorns, but they are both, botanically, fruits. A tomato, in fact, is classed as a berry, since it’s a fleshy fruit with a thin skin which develops from a single ovary (sounds quite human, really.) By this definition, bananas, pumpkins and watermelons are berries. No wonder botanists and chefs drive each other crazy. So the definitive answer to “Is a tomato a fruit or a vegetable?” is: who wants to know? ITCH: Everything You Didn’t Want to Know About What Makes You Scratch. Poison ivy and even more fun! In Praise of Poison Ivy: The Secret Virtues, Astonishing History, and Dangerous Lore of the World’s Most Hated Plant. Identification, tips for healing the itch, and why birds love PI–everything (and more) that you ever wanted to know about poison ivy. Leaflets Three, Let It Be! A picture book for pre-K to Grade 3, to help the youngest explorers enjoy nature safely. Fascinating details to this perennial question–thx for sharing!! !